The softest and chewiest 5 ingredient low-carb bagels are made with no sugar or butter They make the BEST keto sandwiches at under 8g carb per bagel and are ready in under 30 minutes! I’ve been on the Keto diet for 5 days and I swear if it weren’t for these keto bagels, I don’t know how long I would last. They’re so soft, chewy, and delicious, you won’t believe they’re actually low-carb. You can enjoy them with cream cheese, avocado or make an egg and cheese sandwiches for a filling breakfast. The secret to making these low-carb bagels is cheese. I used mozzarella cheese are the binder to make the bagels chewy. For the flour, I used almond flour and a tablespoon of baking powder. How Do I Make Low-Carb (Keto) Bagels? To make keto bagels, simply microwave 3 cups mozzarella cheese with 2 oz cream cheese for 2 minutes. Next, mix in 1 3/4 cup almond flour, 2 eggs, and 1 tablespoon baking powder. Shape into doughnuts and bake for 15 minutes. Are low-carbs Bagels Good For You? Yes, at just 7.5 grams per bagel, almond flour low-carb bagels are a delicious low-carb alternative to bagels. They are great if you are trying to lose weight or on a KETO or PALEO diet. 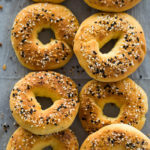 How Many Carbs are in a Low-carb (Keto) Bagel? 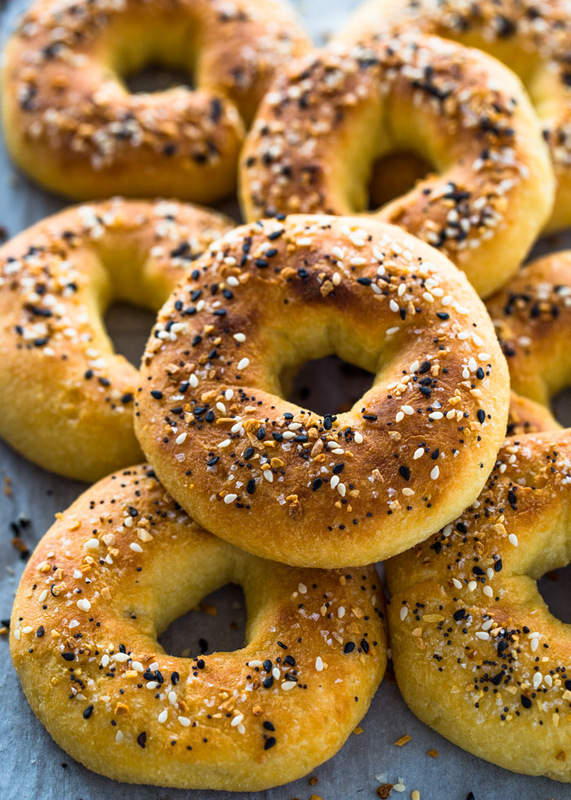 A keto bagel is about 8 grams carbs per serving. They are a little smaller than regular size bagels but are very filling. The BEST low-carb and Keto bagels made with fathead dough. 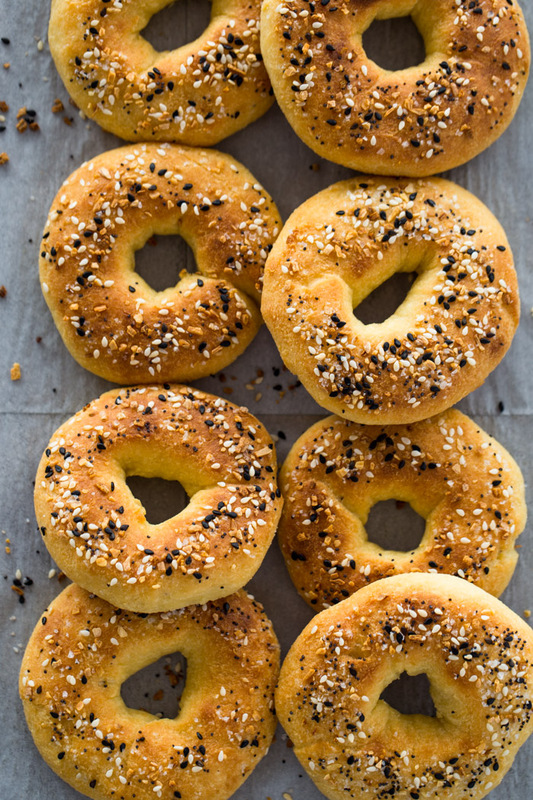 They're chewy, soft and under 8g carbs per bagel! Add the mozzarella cheese and cream cheese to a large microwaveable bowl. Microwave for 2 minutes or until the cheese has melted. Remove from the microwave and stir with a four until fully combined. Immediately add the almond flour, egg, and baking powder. Stir to combine until the flour and eggs are incorporated into the mozzarella. If the dough is sticky, knead with hand until long longer sticky. Divide dough into 8 equal portions. Shape each portion into a doughnut shape. Place on prepared baking sheet. Garnish with the desired topping or leave plain. Bake 15 minutes. If desired, broil for 1 minute to brown the top of the bagels. If the dough is too sticky, reheat for 30 seconds in the microwave and re-mix and it should hold up. If it's still sticky after reheating, add 1/4 cup more flour and mix in. 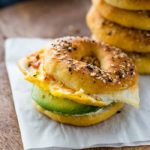 Healthy Low-carb keto bagel sandwich filled with avocado, egg, and sriracha. Slice keto bagel in half. Slice half of a small avocado into thin slices. 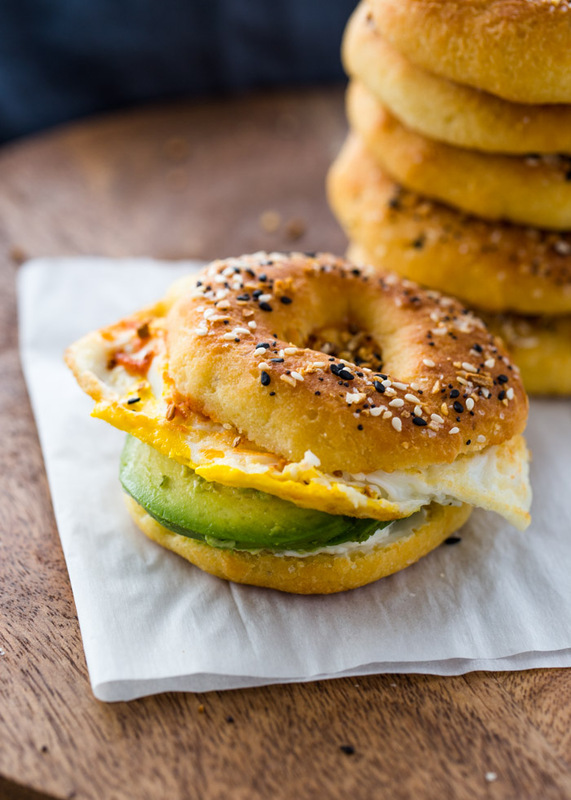 Top bagel with 1/4-1/2 of an avocado and a fried egg cooked to the desired doneness. Drizzle with sriracha and cilantro. Enjoy! For Storing, do they freeze well and how long do they keep in the fridge? Im assuming you need to Jeep them in the fridge? DELICIOUS! ONLY ONE THING I FORGOT WAS THE FULL TABLESPOON OF BACKING POWDER AND THEY DIDNT RISE THIS HIGH. AND i LEFT THEM OUT ALL NIGHT FORGETTING THEY WERE MADE OF CHEESE.. OOPS SO I AM MAKING THEM AGAIN TODAY. HOW DO YOU REHEAT THEM WITHOUT THEM MELTING??? Heavenly bagels. Turned out perfect. 9:30 at night, i’m googling for breakfast ideas, and I land on a site that links to this. 10:30pm, and these bagels are done. It really took me about 30 mins, but I was actually making bacon at the time too. Anyways, this. was. amazing. Wife loved it, I loved it. Only had the one so far, but it was perfect. I didn’t have everything spice available, so I just made these plain (but will try something else later), but they were still perfect. 10 / 5 stars. I’m happy to hear the bagels worked out for you, Chris. I’m sure you will like them much better with the everything bagel seasoning! These are aMaaaazing!! Tried them for the first time last week, very easy to make! So delicous!! They have become our weekly meal prep for the week! We make two batches and freeE them and they warm up wonderfully!! Thank you for the recipe! Well be definitley Trying your other recipes!! I live in Hungary, and there are sets of cups/spoons available for U.S. recipes at a lot of stores, you might want to check as I am quite positive you can get them in Brazil, too. Or, just grab a set from eBay or Amazon. They actually make cooling so much easier. You SaVEd me! I am a carb addict and I am really trying to limit my daily carb intake. I have these as my afternoon snack. These are so so good!! Has anyone tried making these sweet? My kids are not digging the everything spices….i sure do! But it made me think that i could probably make them a sweet bagel. tips? ideas? advice? how do you store them…. ziploc bag on counter? Fridge? These keto bagels turned out amazing!!!! I will make them again for sure. When I tried these they weren’t as thick as the ones in the picture. They flattened out and barely had a hole in the middle. Any Tips? Why did they flatten out? I’m not sure why they flatten out but it could be due to the brand of almond flour. I would add another tablespoon of almond flour next time and see how they turn out. I made these and when i plugged in my ingredients to my fitness pal i got the carbs as 2.5g per bagel. Is your NUTRITIONAL label with added cream cheese after? We made them this weekend, they are amazing! Hi! I love the ease of your recipe for these bagels but I have a tree nut allergy and can’t use almond flour. Is there a way to make these with another kind of flour? I’m sorry I have not tried the recipe with any other type of flour but you might be able to use coconut flour.